I never go back and look at old blog posts, but I'm sure it must be buried in there somewhere. I know I teach about this in every class I offer. Basically what it comes down to is that there are enough pretty photos out there. I wanted to go, instead, for visceral. I never shared that word with anyone until just now, but that was my goal with my images. I wanted them to be felt, maybe somewhere in the solar plexus or maybe somewhere that wouldn't really be named or identified. Fast forward to this morning. I just woke up from a full night's sleep, which in itself is kind of a miracle. We live in a tiny two bedroom, third floor walkup, so my room is also Lily's room. She never wakes up, but she does kick, and laugh, and cough, and turn herself upside down. Lily doesn't wake up but I do. At least ten times. But last night I set Thomas and her up with a super cozy sleepover in Braedon's room and declared that I needed one good night's sleep. I took a too-hot coconut oil bath and passed out at 9:30 in a giant bed, alone. The shades are still drawn, I am still tucked in. I woke up with tears still in my eyes, and all I could think to do was write. My dream last night carried a message, and I think I'm sharing because I don't want to forget. I was a teacher at a camp for creative children. Sort of like the one I actually went to in high school, but it all went down in a giant aquarium. At one point I made protest posters for the giant polka dot sting ray that people were riding on like a pony. I was sad for the beautiful things trapped behind the glass, and kept correcting tourists when they walked by. "Oh my gosh look how pretty that dolphin is," they'd say. "Oh but did you know they are also super smart and they give birth tail first? Did you know they care for the sick and elderly in their tribe with fierce reverence and care?" I followed behind. So, at one point in this dream, one of my student campers came over and said she wanted to give me a makeover. Her and few other girls who all looked like super models dragged me into a public bathroom and did their thing. There was makeup and hair and a new outfit. I wore earrings and bracelets and my nails were painted. I did not smell like bone broth. "Look!" they squealed, as they spun me around in the mirror, "Look at how pretty you are!" I walked through the crowds in the aquarium, and in my mind, everyone's thoughts were interrupted by, "Wow. That lady is really pretty." I moved with a false (we'll get to that, later) sense of importance and confidence and part of me felt like I had won something every time someone's head turned. This next part is ridiculous and embarrassing, but important, so it stays. In the middle of my pretty parade through life, I walked into the backstage area of a giant exhibit. There was water, ankle deep, and I was wearing flowy magical high-waisted pants, and a big swooping white jacket. I didn't know jackets could swoop, but this one did, and in my dream I remember specifically thinking, "This coat is worth whatever the cost is, just because of how it makes me feel." So, there I was walking on water like the queen of the world, when suddenly a giant gust of wind blew my jacket open and threw me off balance. Out of nowhere, someone grabbed my elbow to help me steady, and when I looked up, it was Leonardo Dicaprio. This is the point of the story where I need to share that I, in no way, at any time, have ever thought of this man as attractive. I've always been the girl who loves nerds. The slightly off-center boys with beautiful brains that go for days. In college one night while eating ramen with my girlfriends, I pinpointed that the sexiest scene in the world to me would be a crazy smart boy, who had just finished mowing the lawn, sitting in a quiet library corner, studying for advanced calculus. (AKA my now husband!) So, the fact that Leo showed up in my dream is more than a little surprising. He is not a nerd, he parties a lot, and he is mega famous. But, he also only dates models, a fact that makes him the most perfect person to have popped in to this dream. So, he grabbed my elbow, and then slid his arm around my waist, and our eyes met. He told me he was there on business, and alone, and would I like to have dinner later. He didn't really ask, he just kind of told me that's what was going to happen, and then he ran away, because he was in a hurry. So there I was, polished and primed, having just been hit on by a movie star, and I panicked. I ran to find the campers who gave me my makeover, and I begged them to help me get ready for my date. They jumped up and down and started high-fiving and hugging each other. "Why are you celebrating like this?" I asked. "Leonardo Dicaprio only dates the BEST women in the entire world. He is the leading expert in the world of pretty. The fact that he is interested in you means that we did an incredible job! He would have never even noticed you this morning when you were invisible!" And I realized, before my eyes were even fully opened, that I hadn't just given up pretty pictures all those years ago, I had given up being pretty, all together. I don't own makeup, I wash my hair only a few times a week, and my daily uniform consists of $5 leggings and a cozy cotton shirt picked up at Goodwill. I currently own two pairs of shoes. One is a pair of ballet flats for when I shoot weddings, and the other, which I wear every single day, is a pair of bright yellow plastic flip flops I got from a campground gift shop when we were traveling, so that I didn't have to touch the floor of their muddy showers. I woke up this morning and realized, with certainty: I am not pretty. Last month I signed up to take a class taught by my dear friend, Carolyn Mara, called The Unapologetic Artist. It's a collaborative class focused on choosing a creative photography project, and then experimenting until you have a handful of images that tell a cohesive story. I played with a bunch of different ideas, but in the end, I decided to explore the idea of being desirable. What does it mean to be desired? What does it feel like? And, more importantly, what would I have to do to feel it? I never shared the images with anyone, and never will, ever. There are frames of me in see-through lace dresses, crawling on the floor. Frames of me with my face covered in makeup, fake eyelashes with feathers on the ends, glued to my lids. Frames of high heeled shoes and fake nails painted red. A collection of images of me trying to fit into a mold I will never fit into. And the reason these images will never see the light of day, is because I hate them. I mean, sure, part of me knows that if I shared them they might garner a bunch of attention, and if I'm being really honest, I think I do look pretty in them. But, through this experiment I learned that I wasn't born to be desired. I wasn't born to be looked at like a glowing fish behind a thick pane of glass. I have nothing bad to say about women who spend hours and hundreds (thousands?) of dollars on making themselves desirable, and in fact, I have spent many years of my life wishing I was one of them. But, it turns out, I am not. 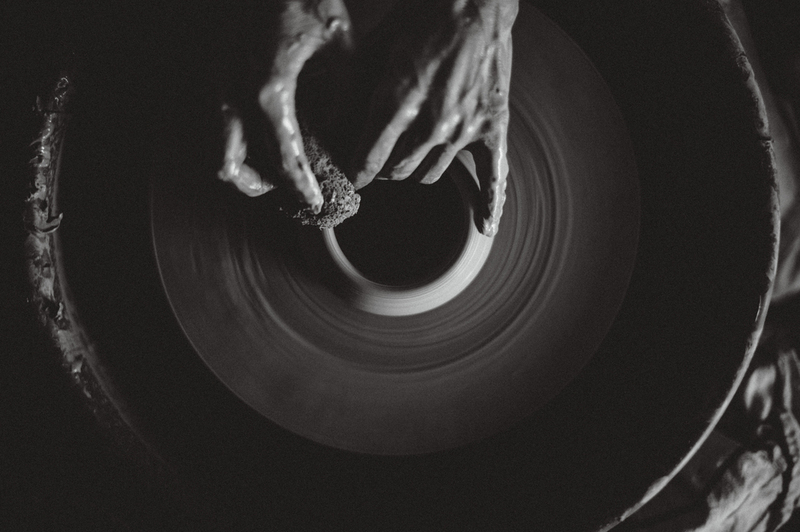 The other day I was making bowls at my pottery wheel and I asked Thomas to grab the camera. My hair was in the typical greasy topknot, I was wearing the same exact t-shirt I am wearing right now, and instead of pants, I had on his boxer briefs. "I feel beautiful right now, and I want you to take my picture," I told him. He didn't say anything (because he's Thomas) and just started clicking away. I keep getting tons and tons of direct messages this week from people selling makeup and wrinkle cream and other stuff marketed to women who feel they need to be "fixed." I love that you guys are trying to get your hustle on, but I'm going to keep it real for a second: I don't wear or own any makeup and I don't put any chemicals on my face; only coconut oil and aloe. I am happy in my own skin and I'm kind of bummed out you think I'm not good enough this way. When I close my eyes and picture myself all old and weathered and covered in a million, billion wrinkles, I get really, really happy. As a little girl, I used to look at the elderly women in National Geographic magazines and encyclopedias from all around the world and seriously fall in love with their intense beauty. I don't need to be fixed or altered. I'd rather pay a therapist to help me love my insides. Sooooo, until you are selling tickets to hear a sage old medicine woman speak about what true self-love and beauty is, with her wrinkles and imperfections hanging proud, I'm not the door to knock on. And then someone wrote in the comments, "Saying it's good and right to love the way you're aging makes others who want to use make up and products feel like they're wrong somehow." And then I had that dream last night, and I'm sitting here this morning, like ENOUGH. You know what, I am not pretty and Leonardo Dicaprio, the royal king of Pretty Land, is not banging down my door. I do not care about being desired and I do not care about the products that grant me a false sense of inner confidence, but, I do feel beautiful. I do. And why not share that? I feel beautiful when I am in the rivers, covered in mud and sweat, photographing women from around the world. I feel beautiful when I am playing tag with my children in the 99 degree Texas heat, bugs stuck to my forehead like a windshield. I feel beautiful when Thomas holds my hand under the dinner table, and kisses the top of my messy hair. I feel beautiful when I have a fever of 103 and speak in front of a group of hundreds. I feel beautiful with tears falling fast down my cheeks after my son sings "Hold Back the River," while sitting at the end of my bed. I feel beautiful covered in clay, laughing at my pottery wheel, with Lauryn Hill blaring in the background. I feel beautiful dancing around the living room with Lily to the latest top-40 hits, just after she's had her bubble bath. I feel beautiful in those moments. Not pretty, not desirable, not ego-driven or self-important. I feel visceral and raw. I feel powerful and peaceful. In my own skin, and completely imperfect. And I think I never hit publish on the blog post with those pottery wheel images because I knew that people, like that woman who commented on my Facebook post, would feel insulted, somehow. But this morning, with the light now clearly peeking through my window, I feel like I need to stop hiding. Those girls in my dream, I think, were absolutely wrong. I don't need a makeover. It is, I think, entirely possible to be myself and not be invisible, and, dare I say, to be myself and be beautiful. Forget desirable. Forget pretty. Forget makeup and nail polish and expensive jackets that swoop. You want those things? Fine! Awesome! Fantastic! But I wasn't born to care about those things, and I won't feel bad about that, anymore. So, I'm going to sit my fanny down at my pottery wheel, just as I am, and own it.